At the urging of Gov. Rick Perry, Texas A&M University-Commerce developed an online degree program that can be completed for less than $10,000. So why doesn't it want its freshmen to sign up? COMMERCE — In 2011, when Gov. Rick Perry urged Texas universities to find a way to offer degrees for less than $10,000, many in the higher education world scoffed. Texas A&M University-Commerce leapt into action. Within two years, the East Texas school had developed a program that allowed students to earn an online bachelor's degree in organizational leadership at far less than the $40,000 it can take to spend four years at the university. The program has since earned praise from state leaders, who have tried to encourage other schools to replicate the success. But in Commerce, the university's top leader doesn't tout the program much. Instead, he pushes freshmen to live on campus for at least two years and enjoy an experience that mimics the best liberal arts universities in the world. The online affordable degree serves a small niche, he says, but it's not ideal for 18-year-olds straight out of high school. "Online: For graduate students, it's tremendous," Ray Keck, the university's president, said in an interview in his office this month. "For undergraduates, it's an accommodation." Keck acknowledges that his approach "is the exact reversal of what we are being told to do right now." In Texas, universities are under pressure to dramatically cut frills and use technology to offer a cheaper path to a degree. Keck said he's happy to create such a path, at least for students who are older and have families and jobs. But he's convinced that the classic model of higher education works best for young students. And he's not willing to offer those students a bare-bones education. He made that clear when he arrived in Commerce in 2016 following the death of the previous university president, Dan Jones. With the $10,000 degree already in place, Keck went to work pushing a redesign of the freshman experience on campus. This year, the university is rolling out a program for first-year students that divides them into 25-person "houses" designed to take classes together and help each other navigate their college experience. The program includes a book assignment for the entire freshman class — this year it was "The Immortal Life of Henrietta Lacks," by Rebecca Skloot. And each student is required to enroll in a signature course. The course subjects vary from drug and alcohol addiction to food culture to the role of music in movies. The university's senior faculty and top administrators are encouraged to teach the courses. This semester, Provost John Humphreys is teaching one called "Business, Society and Unfettered Thought." "I want my students to understand the link between business and society," Humphreys said. That's a far different experience than the one offered by the $10,000 degree, which rolled out in January 2014. That program allows students to take fixed seven-week terms that cost $750 each, no matter how many courses they take during the term. Instead of traditional course credits, the online students are required to master 99 "competencies," or skills related to the applied technology degree. Students can get credit for some of those competencies if they show that they acquired them from prior college courses, work or military experience. The program was conceived with needy students in mind. State leaders hoped the cheaper option would help current students save money while putting market pressure on traditional programs across the state. "Imagine the potential impact on affordability and graduation rates, and the number of skilled workers it would send into the economy," Perry said in his 2011 State of the State speech calling for such a program. But Paredes acknowledges that it’s not for everyone. 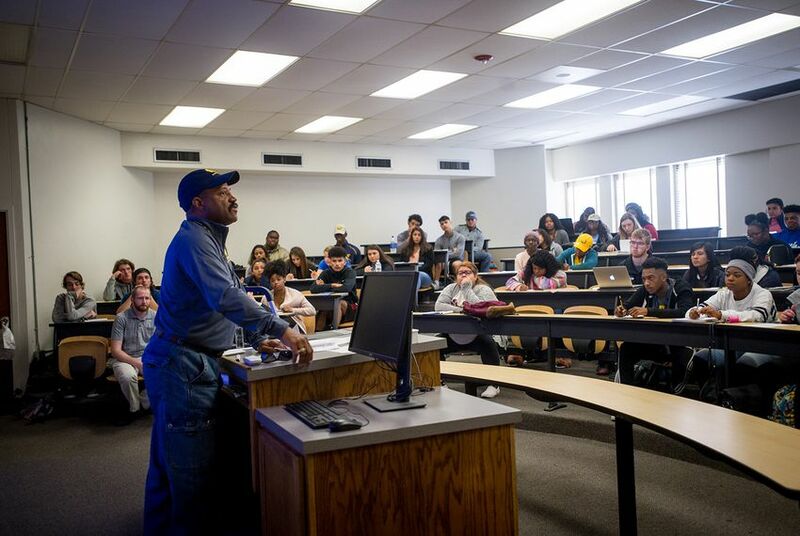 A&M-Commerce’s $10,000 degree program is self-paced, making it perhaps more realistic for older, more driven students. The average age of students in the program is 39. And all but 3 percent enter with at least some college experience. The number of those "nontraditional" students is growing in Texas, Paredes said, and the state needs more options to serve them. But Keck said he wants to keep the online program focused on them. For 18-year-olds, he has other ideas. School officials point to students like Jantavia Carey, who said in an interview that she arrived as a freshman from Dallas in 2016 “knowing nothing” about how to succeed in college. Her parents didn't go to college, she said, so she didn't have people go to for advice on things like college social life, dealing with the financial aid office or keeping a firm study schedule. But by living on campus and enrolling in leadership programs, she was able to seek help. Now, she mentors freshmen. They meet regularly to opine on things like time management, study habits and campus social life. “My experience has been amazing,” she said. The goal, school officials say, is to create a learning community that encourages students to succeed. And Keck hopes to expand it beyond just freshman year. He says the school hopes to eventually start a college of liberal arts within the university, and he's working with the city of Commerce on reviving its downtown in hopes of making the city a more attractive college town for students and faculty. All that comes at a price. When accounting for tuition, textbooks and living expenses, and subtracting financial aid, the average A&M-Commerce student spends around $9,327 per year on college, according to federal data. That's well below the national median, but it adds up to far more than a $10,000 degree. But if spending a little for a full college experience makes it more likely the student will graduate, it's worth it, Keck said. "If you get people engaged and excited right away, you will retain them," he said. Correction: A previous version of this story misidentified the name of the degree offered through the affordable online program. It's a degree in organizational leadership.